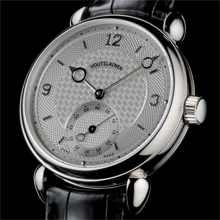 The Voutilainen Vingt-8 wristwatch perfectly encapsulates the philosophy of Kari Voutilainen. Its elegant and strong mechanism is housed in a stylish and robust case. The in-house movement of the Vingt-8 was designed, built, fabricated, finished and assembled in its entirety in Voutilainen workshops. The design and philosophy of the movement combines respect for longevity and precision with classical watchmaking tradition. The movement has a very large balance wheel manufactured in-house, allowing perfect regulation of the watch to within strict tolerances. To equip such an exceptional timepiece, a very rare and unique balancespring system has been used. 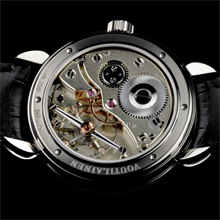 The exterior of the spring uses a typical Breguet overcoil, while the internal curve uses the little known Grossmann curve. The balance-wheel bridge is sublimely elegant, offering an unimpeded view of the escapement and balance. It also allows the enthusiast to admire the synchronized  movements of the escapement wheels. In-house movement. Design, construction, fabrication, finishing and assembly in Voutilainen workshops. New escapement, with two escapement wheels, direct impulse. Main plate and bridges manufactured from German silver. Wheels manufactured from rose gold.